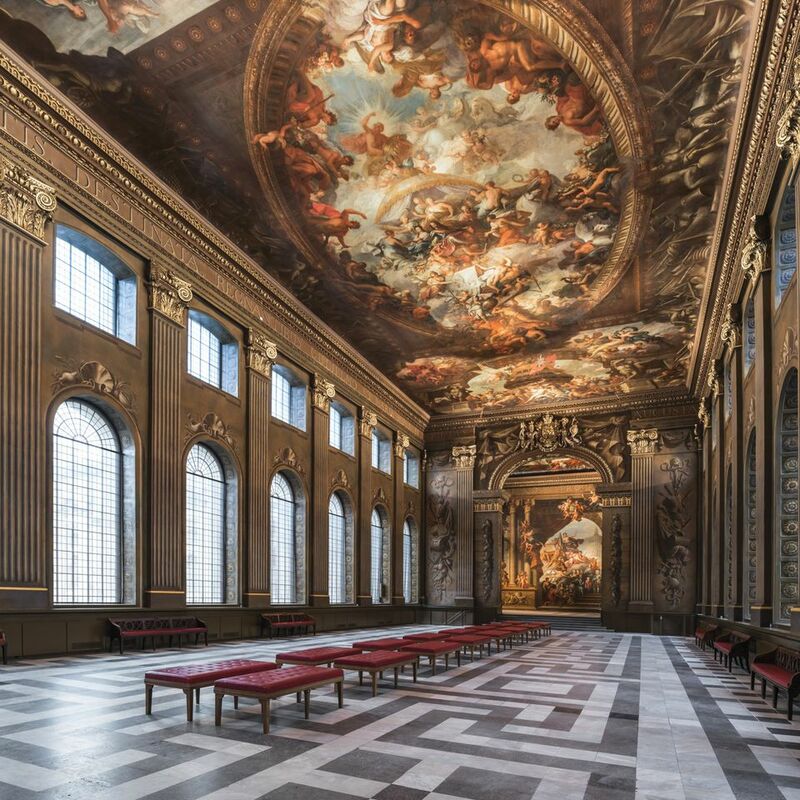 When the Painted Hall in Greenwich reopens on 23 March, visitors can have a nice lie-down if overcome by the 4,000 sq. 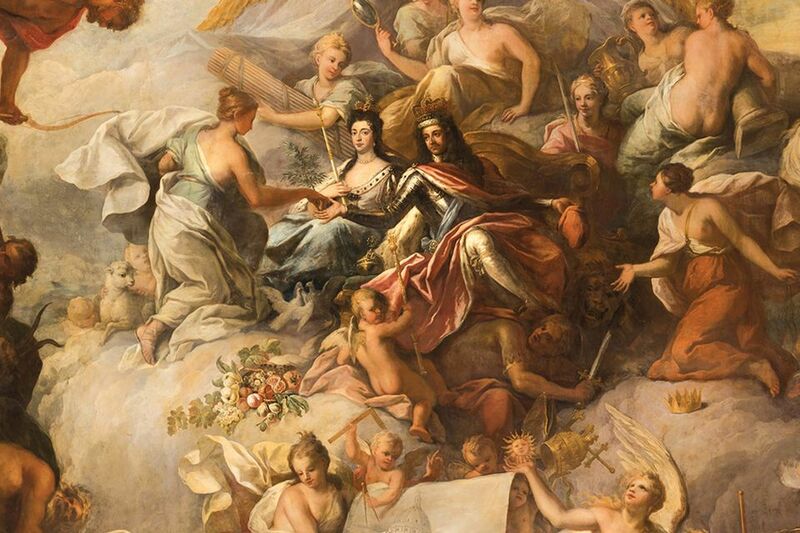 m interior painted by James Thornhill in 1707-26 with a tumult of kings and queens, beefy nymphs and cherubs, billowing clouds, cascading draperies, allegorical figures including peace, time, truth, Europe and America, and a thinly disguised image of Louis XIV squirming like a serpent while being trampled underfoot. The project to restore the dizzying grandeur of the centrepiece of the former Royal Hospital at Greenwich, originally designed by Christopher Wren as a home for old sailors, included commissioning beautiful oak day beds upholstered in crimson leather. Benches removed over a century ago, made when the hall served as the first national gallery of naval art, have also been traced and borrowed back from the National Maritime Museum just up the hill. The work on one of the most spectacular rooms in Britain has taken more than two years and cost £8.5m, including £3.1m from the Heritage Lottery Fund. Apart from gently cleaning the 300-year-old painted surfaces—including a brown stain said to be gravy from a rollicking dinner—and restoring damaged areas, the project included a subtle new lighting scheme and mesh blinds allowing views through the towering windows. The handsome stone undercroft now has a cafe and shop and, for the first time, an interpretation centre. A glass barrier around a hole in the floor also allows views down to one of the most surprising discoveries: two extant rooms from a demolished Tudor palace at the site where Henry VIII was born and often returned to celebrate Christmas. The Painted Hall is not true fresco, but oil paint applied directly on to the plaster. It has survived remarkably through centuries of sweat, candle smoke and London grime. Palin salutes his 1950s predecessors, who did him a favour by removing 15 coats of discoloured varnish. Thornhill’s work is not universally beloved—and it takes a leap of faith to accept the regular description of the hall as “England’s Sistine Chapel”—but it is unquestionably monumental. Francesco Rosellini, the Florentine who led the restoration team, says: “I have more respect for him now.” It became the largest open-access conservation project in Europe with 85,000 people paying to climb the scaffolding and watch the work close up. Among the grand occasions was the lying-in-state in 1806 of Vice-Admiral Lord Nelson, whose body was shipped back in a barrel of brandy after his victory and death at the Battle of Trafalgar. For a period after 1810 it became the first national gallery of naval art, and then a dining room again when the Old Royal Naval College took over. The navy only finally left in the 1990s. Thornhill’s work celebrated British naval power and the political fix which secured a Protestant monarchy through the coronation of Mary, the Protestant daughter of the deposed Roman Catholic James II, and her husband William of Orange, followed by her sister Anne, whose reign inspired the awards-garlanded film The Favourite. By the time the commission had swallowed almost 20 years of Thornhill’s life, Anne, too, had died childless, the Hanoverians had arrived, and the artist had to incorporate yet another monarch, George I, seated most awkwardly on a lumpy cloud. The huge end wall was the last he completed, and at its foot there is a small man in a big wig and a brown suit: Thornhill himself. His hand is cocked at a slightly awkward angle, either gesturing toward his masterwork or soliciting payment. After many demands he was eventually paid £6,685. George I, though hardly flattered in the depiction, was sufficiently pleased to make Thornhill his court artist, even giving him a knighthood.